Since we published the Streaming Price Bible we’ve been getting data submissions to crunch the numbers. 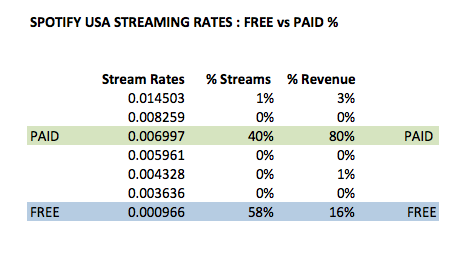 According to one set of data it appears Spotify is reporting seven different streaming rates (in a single month). 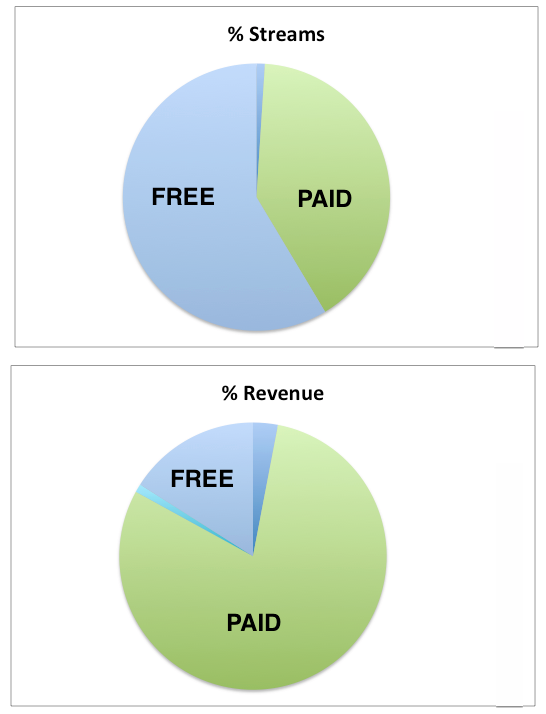 But the most interesting discovery in the data is the percentage of free streaming volume and revenue versus paid streaming volume and revenue. We knew there were two price tiers (Free & Paid) but we didn’t anticipate discovering the other five tiers, even as limited as they are. As we had suspected, the majority of consumption is generating the least amount of revenue. Oh, and for those of you keeping score at home the net summed per stream rate, for all streams divided by all revenue is .00352 in the aggregate. That’s .00169 per stream LESS than reported earlier this year in the Streaming Price Bible of .00521. Just another indication that as streaming models mature the price per stream will continue to drop. 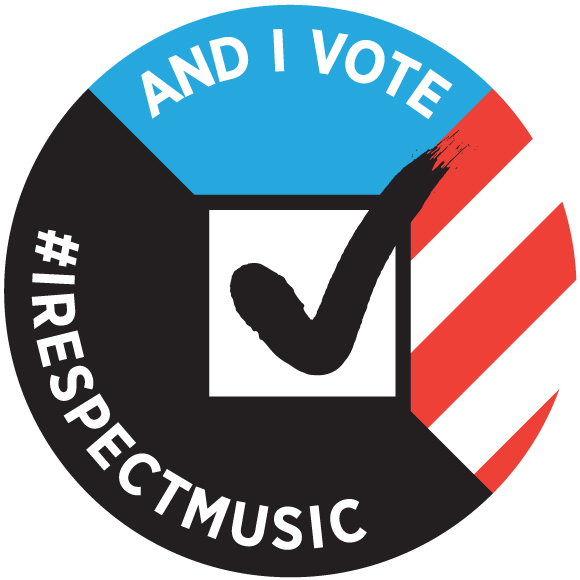 Add to this that even Spotify executives have admitted as much. If you have data that looks different than ours, send it our way and let us crunch it. This is the problem when there is such a profound lack of openess and transparency. There also appears to be an overall lack of consistency. Let’s have some real “disruptive innovation” by “sharing” our Spotify statements and comparing the numbers. 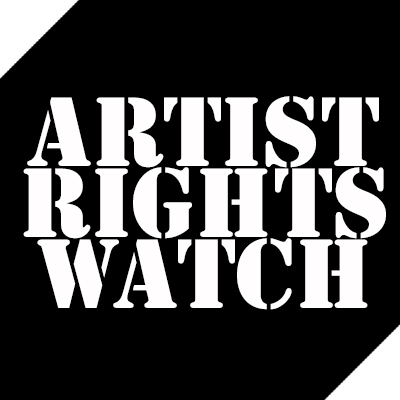 ← Will YouTube’s New Music Service Still Feature Anti Semitic Lyric Videos? I have done kind of the same analysis based on the data of my own label in The Netherlands and data provided by the UK label ClucAC30. The outcome is totally different: 80% of these streams are generated by paying users. Check my article (in Dutch) at http://www.digimuziek.nl/via-welk-spotifyabonnement-wordt-het-meest-gestreamd/ Google Translate will do the trick I hope. I will gladly send you the royalty statements over the past few years so you can check. Let me know who te send them to. As for the tiers. Spotify uses a special tier for Premium users who have activated a mobile client. This is by far the biggest paying user group. Lower but not that low. I checked the ClubAC30 data regarding the number of US streams in 2013 Q1. 80% paid 20% free. Quite a remarkable difference with your findings. I can send you the corresponding royalty statements so you can see for yourself. That’s very different from what we’re seeing, stay tuned. We’d love to see your data. You can send it by email directly to : the trichordist (one word) at mail dot com.